I am wearing red shoes today because red is my favorite color red shoes are fierce as heck every 47 minutes, a woman tests positive for HIV in the United States. Big things can start in small spaces and with small ideas. Six years ago, I was having a G-chat conversation with my friend Karyn about how terrible HIV/AIDS was. One of her good friends had told her he was HIV-positive, and I was touched by a friend of mine who had cousins who were orphaned by AIDS. We marveled at how the epidemic touched so many lives but people didn’t talk about it enough. There was too much shame around it and we wanted to do something, especially concerning how it affects women. Women are the caretakers, but we’re also shamed for acknowledging our sexuality. I mentioned that I think we should do something around red shoes, since they’d grab people’s attention. Karyn suggested we can call it The Red Pump Project. ALL we set out to do was to get our blogger friends to join us on March 10, 2009 (National Women & Girls’ HIV/AIDS Awareness Day) to use their sites to talk about the epidemic. On March 2, we sent out an email to 50 bloggers we knew and loved. We had no idea that 135 would end up joining us a week later, posting the custom red pump badge we created, and dropping stats on HIV/AIDS and how it’s affected women. WHO KNEW that we were starting something that would transform our lives and spur others to share their stories, their pains, their struggles around HIV/AIDS? Who knew that six years later, we’d be a national nonprofit organization with teams in 6 different cities (Atlanta, Charlotte, Chicago, Dallas, DC, NYC)? Who knew that we’d have so many women in the United States and all over the world joining us to put on red shoes because they, too, want to tell others that when HIV affects one of us, it affects us all? Who knew that what started as a passion project would become my purpose project? I am proud to be a part of an amazing group of advocates who are a part of Team Red Pump, empowering women with the message that we are worth saving, and our bodies deserve protecting. We’re holding events, teaching workshops and driving conversation to stomp the shame out of HIV and other sexual health issues. Today on National Women & Girls HIV/AIDS Awareness Day, as we celebrate the 7th annual #RocktheRedPump campaign, Karyn and I will be at an event at the White House, as a part of a discussion on “Stepping Out of the Shadows: HIV & Violence against Women and Girls.” Afterwards, we get on a plane to go to NYC for Red Pump’s first New York event (RED Power Convos), which we’ve partnered with ESSENCE Magazine to make happen. Red Pump was featured in the March 2015 issue of ESSENCE! So I am proudly rocking my red pumps today to stand with all those women who are infected. 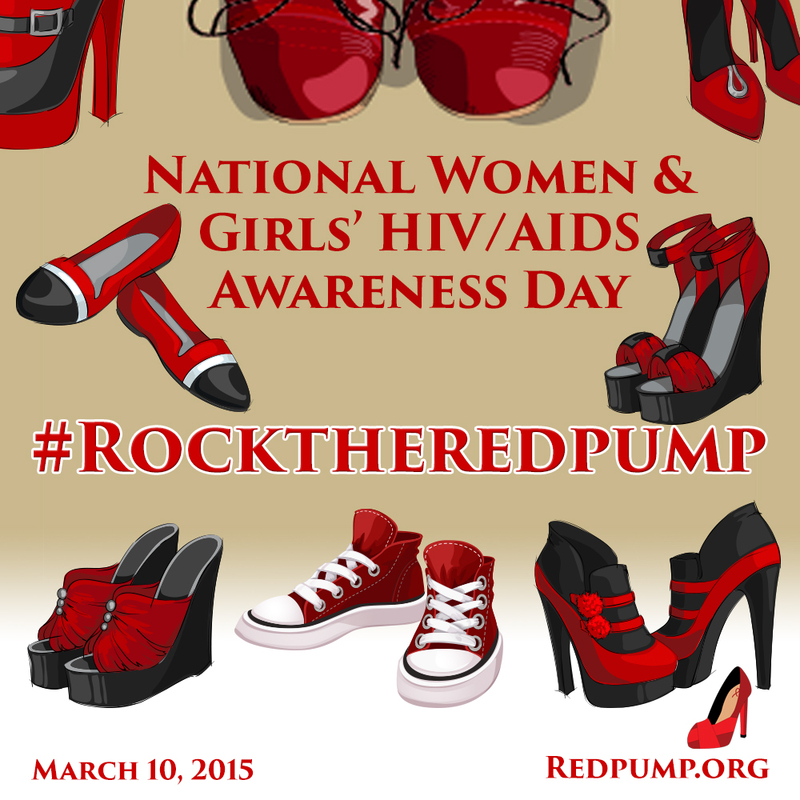 I am boldly rocking my red pumps today to say that there is no room for stigma in this epidemic. I am fiercely rocking my red pumps because we are all the face of AIDS so let’s talk about it. We wear red shoes to get your attention and while we have it, we want to make it count. We want girls and women of all ages to be empowered with information that could potentially save their lives. Donate to Red Pump (we’re a 501c3 org and it’s tax-deductible and helps us continue the work we’ve been doing to educate and empower). Follow Red Pump everywhere (@RedPump on Instagram, @RedPumpProj on Twitter, and on Facebook). Sign up for our newsletter too! Be a sponsor. We have over 15 events every year across the country, and if your brand is looking to reach young women, ages 25-44, we’re your gals! Our next one is in Chicago on March 21 (Rock the RED Fashion show). Our email is info at redpump dot org. Buy a Red Pump t-shirt. If you’re wearing red shoes today (they don’t have to be heels), upload a picture of them on social media and tag it with #RocktheRedPump. Download the square button below and post it to your social media. So yes, this is why I’m wearing red shoes today, and this is why I will continue to. There’s work to do. There are still women like L, who emailed us two weeks ago to say she just got diagnosed with HIV, and was infected by her husband. The Red Pump Project family was the FIRST to know. And in moments like that, I understand that we have so much more to do. Visit the Red Pump website to learn more. The exact red shoes I’m rocking today will be posted on my Instagram (@redpump). Way to go, Luvvie! I am an OBGYN working tonight so no red shoes 🙁 but I appreciate the work that you are doing! On my first day of residency, a very long time ago, I delivered a patient who was 16 years old and got HIV from her first sexual partner. I’ll never forget her. Thank you for what you do. Our girls and women need your support!! I’d love to get involved next year!